If drainpipes were the mainstay and indeed supporter of Doulton’s famous stoneware art wares at Lambeth, then it was their table and teawares that supported the many art ware productions of their Burslem factory, and without whose success we may not have the many collectible wares so cherished around the globe today. A favourite art nouveau trio. 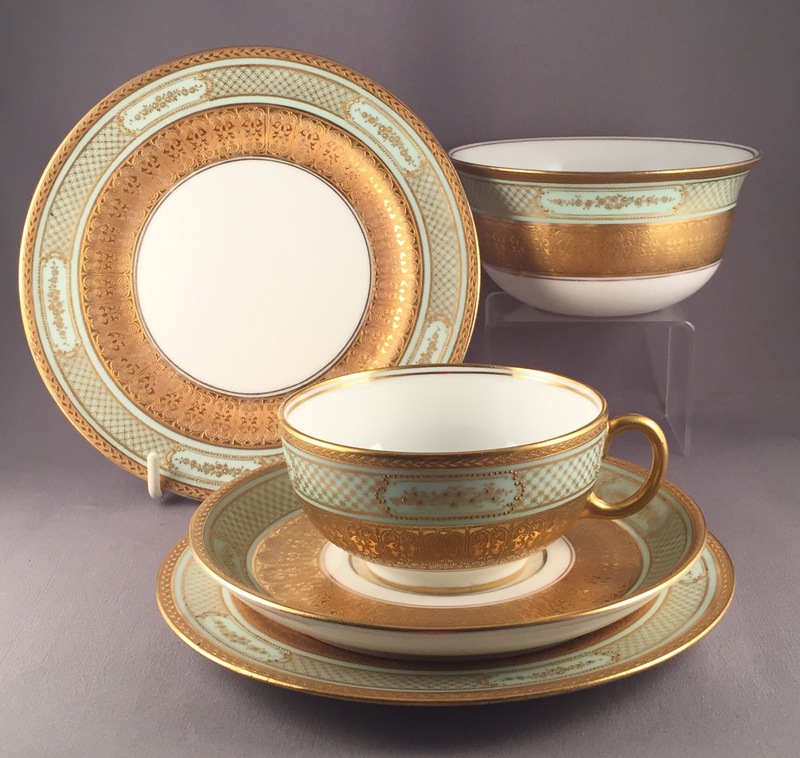 With such a rich history in tableware and teaware production there is a veritable wealth of patterns, shapes and periods to collect from early Spanishware, to Kingsware, seriesware, Bunnykins as well as period styles from the high Edwardian period to the popular deco styles of the 1920’s and 1930’s – once again Doulton more than provided for their clamouring public! 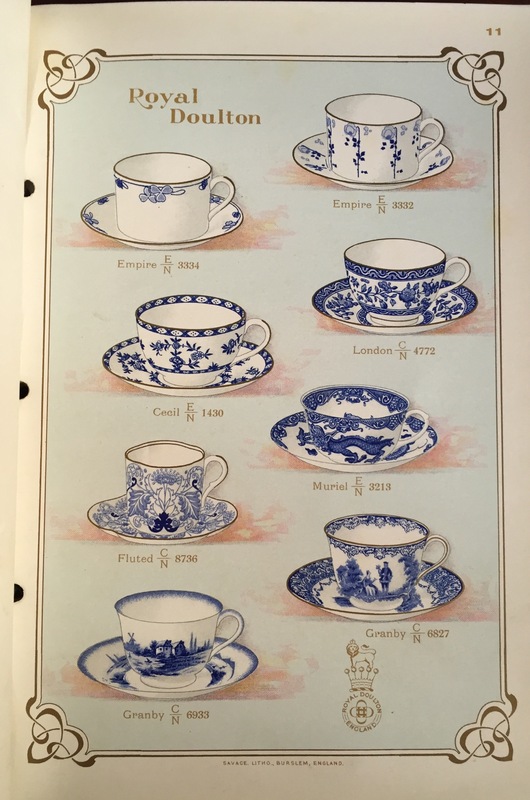 A 1905 catalogue page showing popular blue and white designs. 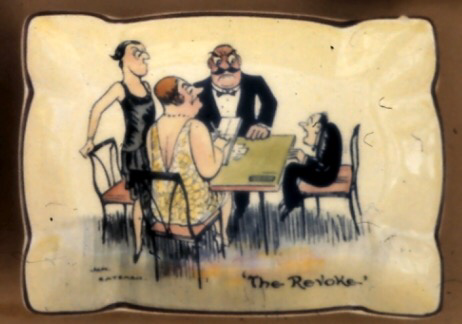 A visit to any antiques market or fair today illustrates how this once unfashionable area is once again ‘de rigeur’ with trios in particular to be found on most ceramics stalls at such fairs. Indeed the increasing popularity of cookery shows on TV including the ever popular ‘Bake Off’ has helped drive up the popularity of tea parties once more. 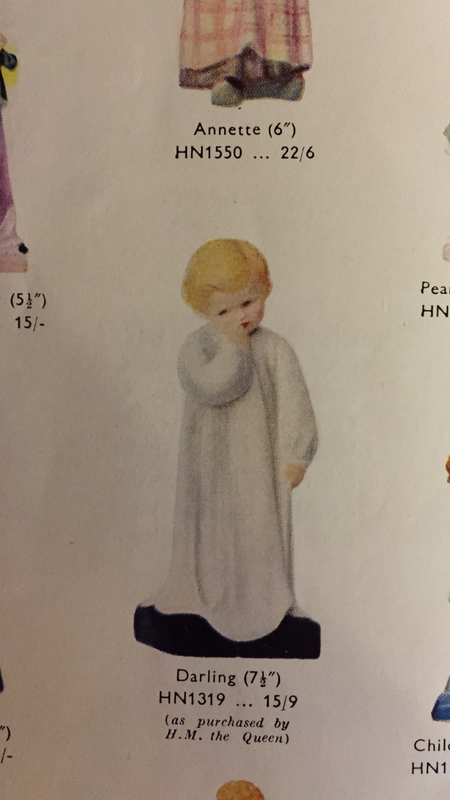 Illustration from a 1930’s tableware brochure titled ‘Grace before meat’. 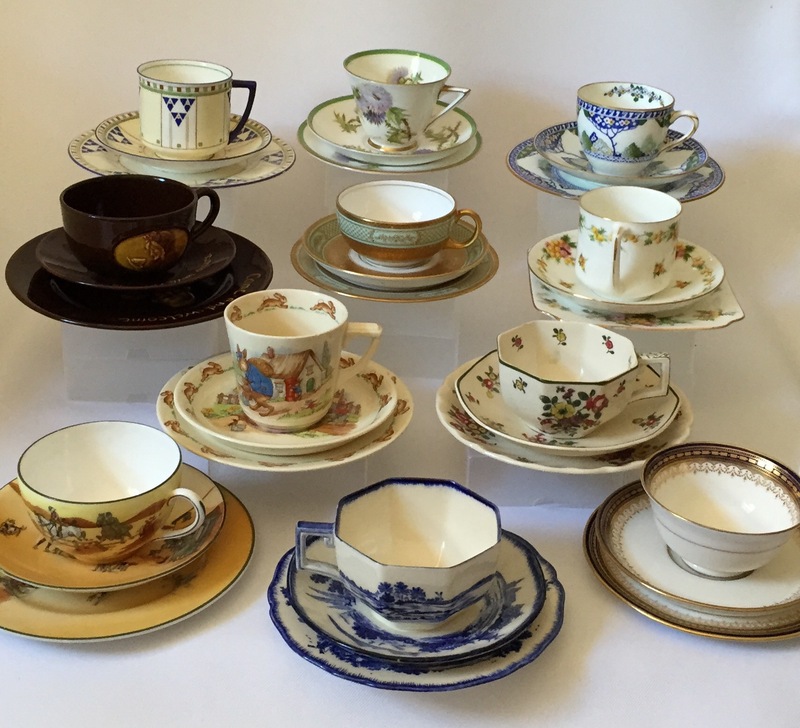 This modern popularity has left the starchiness of high tea behind and what we have today is an eclectic mix of the old and new to suit the 21st C, which is once again making us dig out grannies favourite tea sets and adding new items to our tea tables! A selection of Doulton trios illustrating shape, period, target market place and varying Doulton lines including Bunnykins and Kingsware. 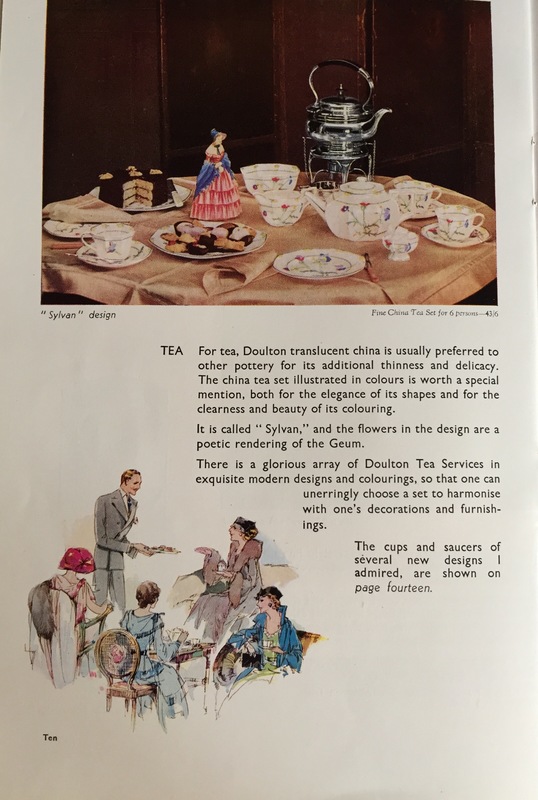 Tea time with Royal Doulton! ….may not be solid gold, but nevertheless it is gold that is used to decorate many of Doulton’s most extravagant Burslem wares produced during the last two centuries! 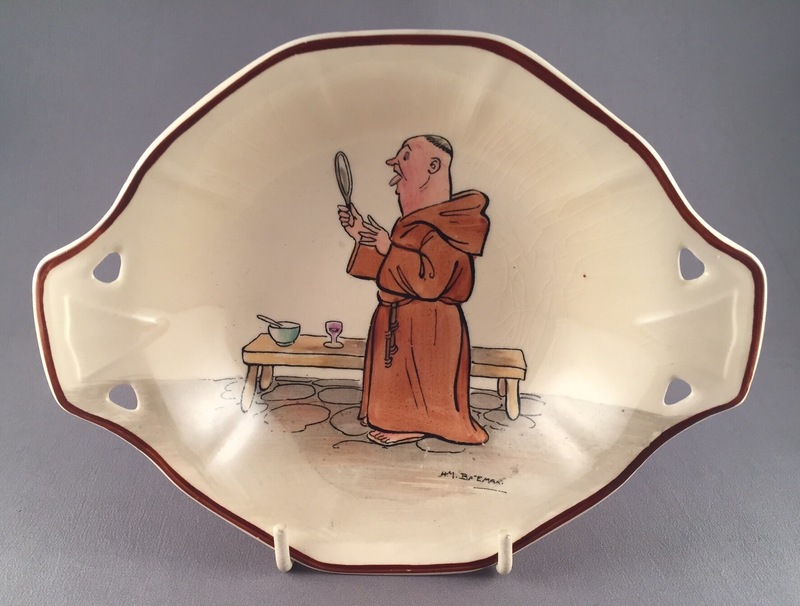 Whether it be wares including Doulton’s famous Spanishware with its gold tracery or the prestigious acid gold etching that is found on quality exhibition items and tea wares (both of which can be seen in the illustration), or else burnished gold to decorate their famous figures, Doulton has always produced something gold to suit every collector. Many of the elaborate gilt design of the 20th Century were designed by Robert Allen, who ran an art department at Burslem and who worked closely with Doulton’s art director CJ Noke on many of their famous lines. Allen’s designs were brought to life by a small band of expert gilders such as Thomas Morton or the Williams Massey and Skinner. 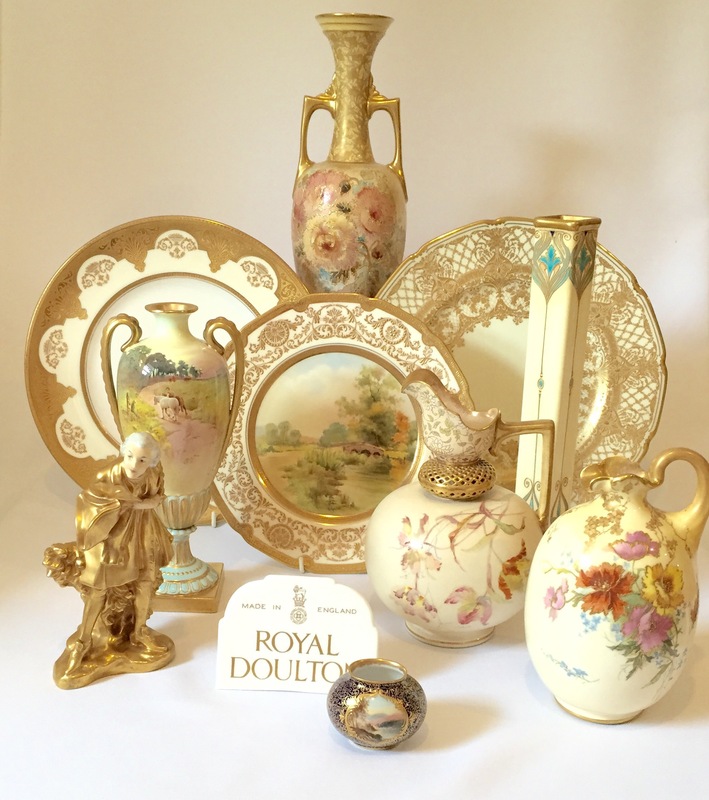 The sheer variety of Doulton’s gilded wares really does mean that there is something for every collector and let us not forget that whilst gilding is not typically associated with their Lambeth wares, it was used on chiné and the gold whorl patterns for decades and can be found on some artist pieces most notable in my experience on the work of Francis C. Pope. 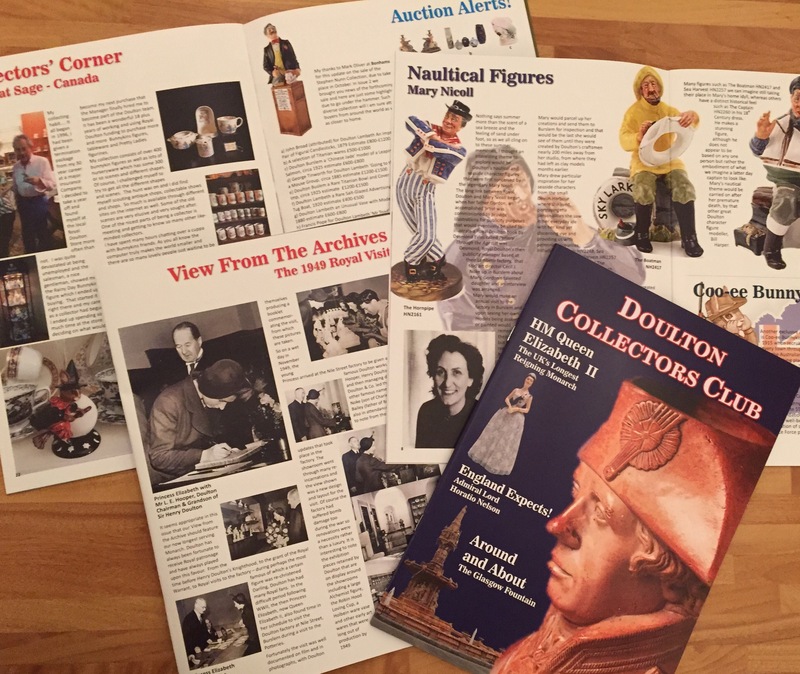 Collectors are often bemused by early Doulton catalogues which carry the strap line ‘As purchased by HM The Queen’ under their cherished figures. 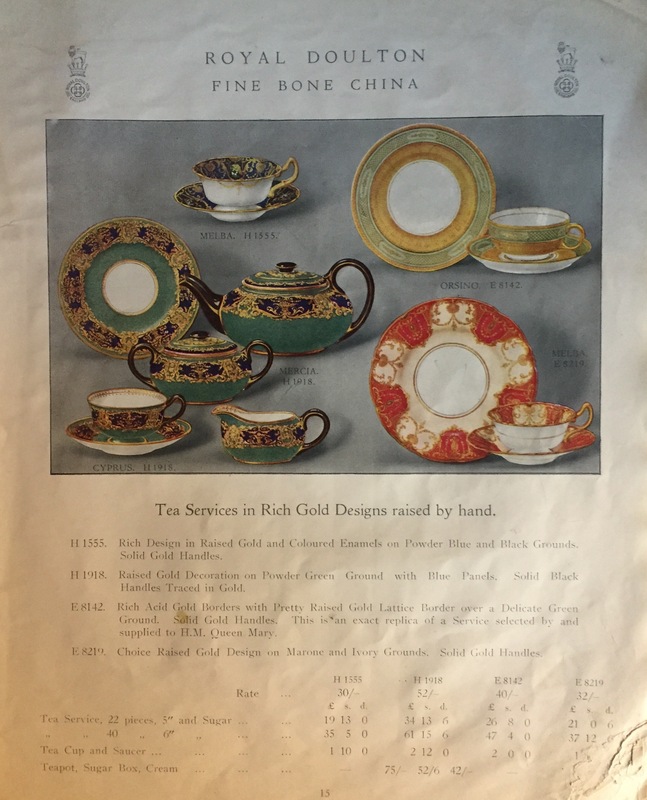 Original catalogue page featuring the design and highlighting the Royal connection. 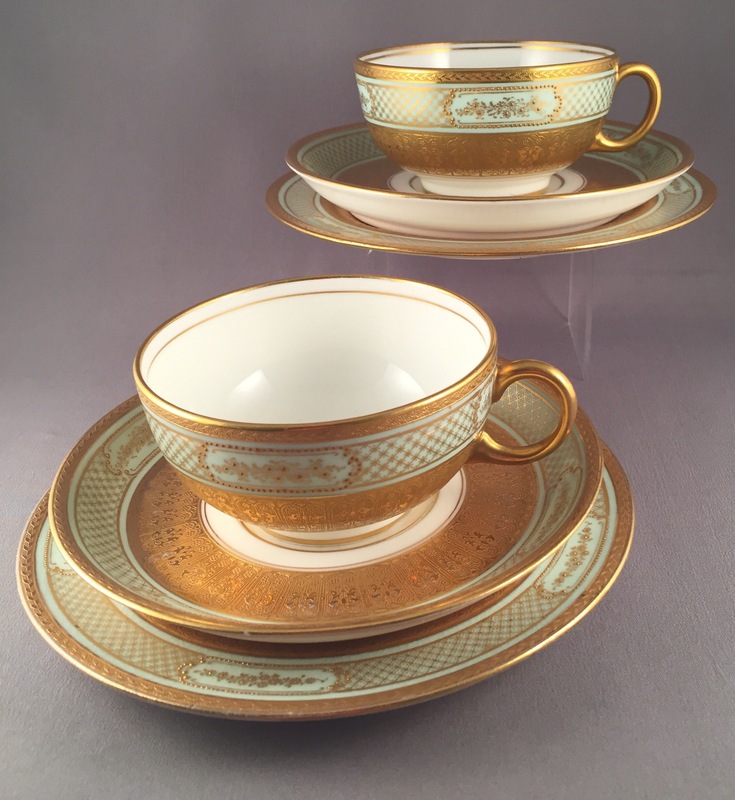 However this sales technique was also used to advertise tablewares such as this heavily gilded tea set, which was supplied to HM Queen Mary in the early 20th Century. This particular set for 6 people is a replica of the original and was retailed exclusively through Harrods, the exclusive London Department Store which has many famous links to Doulton including its magnificent Doulton terracotta façade and of course the art nouveau tiles in the food halls by Neatby. Once again the set shows that first sight isn’t always the end to a story with Doulton! Collecting Royal Doulton’s Royal Commemorative beakers. An advert for the 1911 Coronation beaker of King George V and Queen Mary. An actual example of the same beaker but with the King’s facsimile signature. 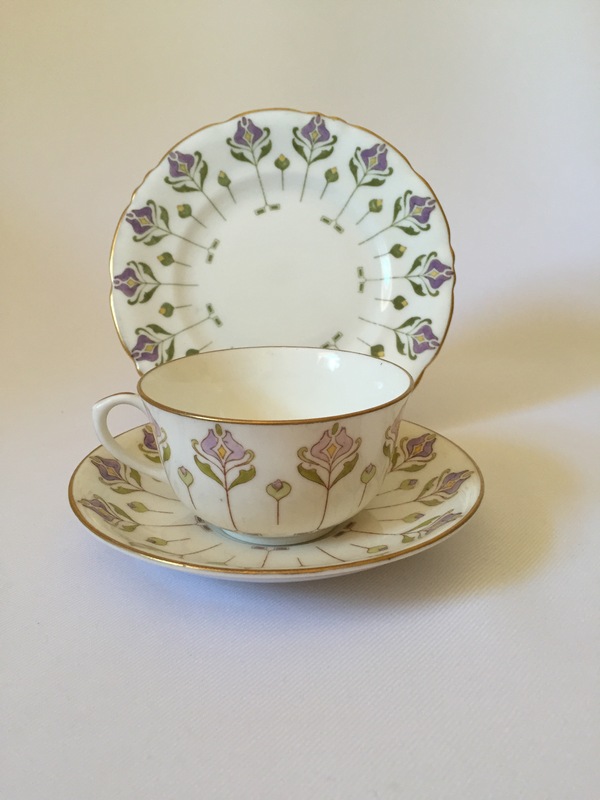 Royal Doulton have a long history of marking Royal occasions by producing commemorative wares of all types but a field that offers a wide range of items is the many commemorative beakers produced for Royal Coronations. Bone china examples of King Edward VII’s coronation beaker from 1902 – front and reverse. 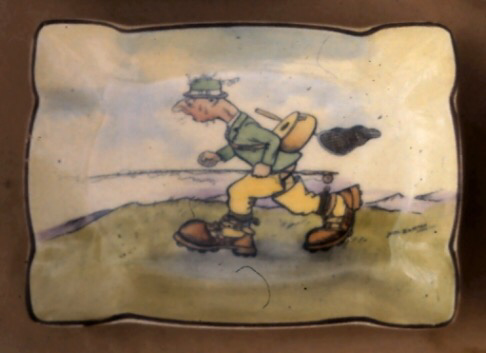 An earthenware example of the same beaker but interestingly bearing the coat of arms for Burslem, the former home of Doulton fine china in the Potteries. 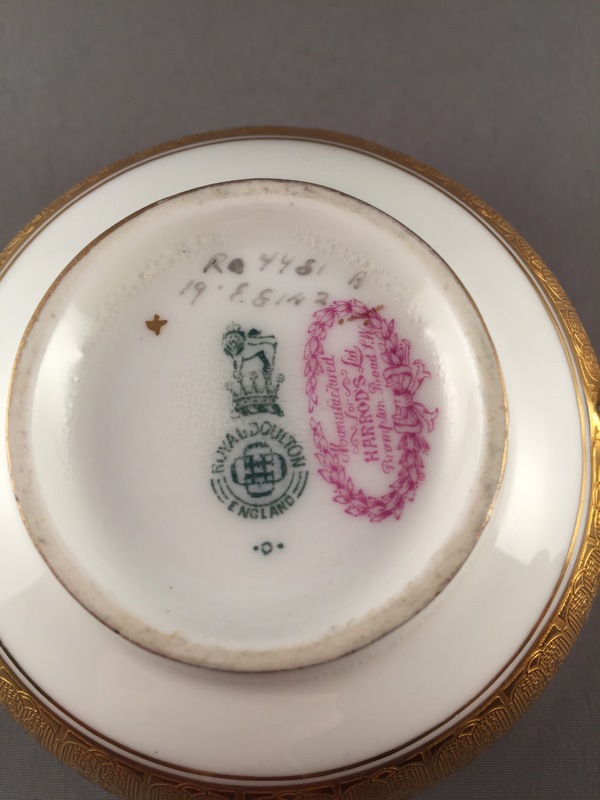 Since Victorian times each Coronation has resulted in a new commemorative beaker; the most collected of which tend to be the bone china rather than earthenware varieties, although unusual earthenware variations attract much interest too. Coronation beaker for the present Queen’s parents, King George VI and his wife Elizabeth in 1937.